The new parties headed by former chiefs of staff agree to run together in upcoming Knesset elections. 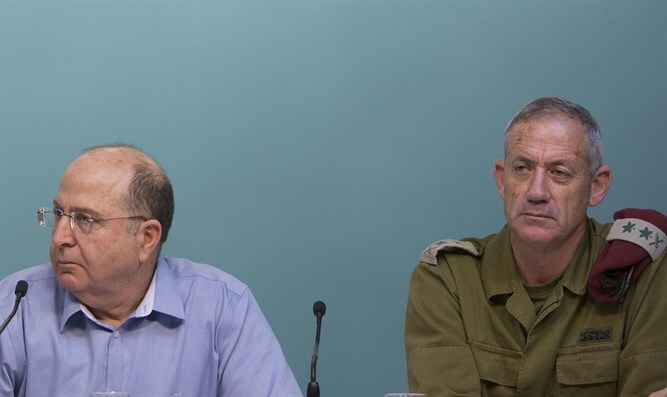 The Hosen Yisrael (Israeli Resilience) party, headed by former IDF Chief of Staff Benny Gantz, and the Telem party headed by former Chief of Staff and ex-Defense Minister Moshe Ya'alon agreed to run on a joint list for the upcoming Knesset elections in April. The two former chiefs of staff arrived at a final conclusion regarding the joint run in the Knesset elections on Tuesday afternoon, after lengthy negotiations between the sides. In light of the agreement between the two, Ya'alon is expected to attend the launching of Gantz's party this evening, during which he is expected to deliver his first political speech. In his speech, Gantz is expected to outline the general guidelines that will guide his party, but he will not address all the burning issues on the agenda. The Israeli Resilience party confirmed that progress has been made in talks with the Telem party headed by Ya'alon. It was also agreed that the contacts would continue.